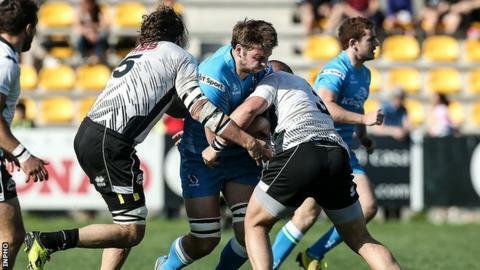 Ulster moved into fourth place in the Pro12 table as they ran in seven tries in a bonus-point demolition of Zebre in Italy on Saturday. Jared Payne secured a hat-trick of scores, with Tommy Bowe touching down twice on his first appearance of the season for Ulster after a knee injury. Ruan Pienaar and Craig Gilroy also crossed the Italian side's line. The Irish province now occupy the final play-off position with games against Leinster and the Ospreys still to come. Ulster had lost 13-6 to Zebre away from home last season but a repeat of that outcome never looked on the cards as Les Kiss's side asserted their dominance from the start. Pienaar set the ball rolling with a third-minute try after half-back partner Paddy Jackson had breached the host's defences, the latter converting from in front of the posts. Home scrum-half Guglielmo Palazzani rumbled over four minutes later, with fly-half Carlo Canna adding the conversion to bring the teams level. Jackson converted after Bowe ran in under the posts, but Canna reduced his side's deficit with the only penalty of the game. Gilroy then ran on to a clever chip-kick from Pienaar to notch his eighth try of the campaign in the 25th minute, Jackson again adding the two points. Payne ensured the bonus point just before half-time with a try in the corner after a period of sustained pressure on the Zebre line. The Ireland international showed a good burst of speed to dive over for his second after fine work by Bowe and Stuart Olding three minutes after the resumption, Pienaar's successful kick making the score 33-10. Payne scythed through the Italian outfit's rearguard again to complete his hat-trick, Pienaar converting, as Ulster exploited their opponents' porous defence to the full. Wing Ulrich Beyers picked up a loose ball and ran over for his side's second try, Canna adding the extras on the hour mark, but the score proved a brief respite for the beleaguered hosts. With one minute remaining, Bowe ran clear to mark his comeback to senior action with his second try of the game, Olding stepping up to knock over the two points which gave his side a convincing 30-point cushion. Zebre are without a win in the Pro12 since beating Benetton Treviso 18-8 at Stadio Monigo on 3 January.